"In my thirteen years as an event producer, I have never received such positive feedback from a keynote speaker before... One attendee stated that ‘it is rare that a speaker not only presents well, but presents quality content.'... Personally I also wish to thank Dr. El Erian for being friendly, flexible, hospitable and considerate to our team." Just sought-out for a keynote entitled "Markets: Making Sense of It All" at the Barclays Asia Forum, a "Global Context on the Future of the US Economy" at IBES 2017, and insights into the global economic and financial outlook at at NCB's Annual Treasury & Corporate Customer Conference. 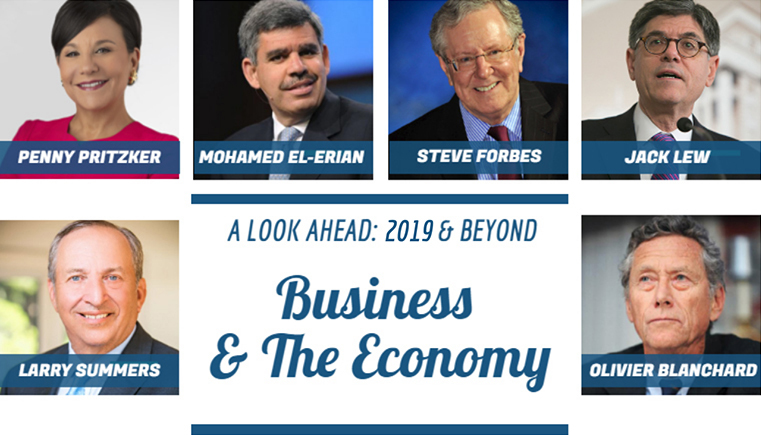 In-demand on a near daily basis by CNBC, Bloomberg, Fox Business, and more for his shrewd commentary on international markets and economic policy, El-Erian shapes the world's understanding of the global economy. "Penny is one of our country’s most distinguished business leaders. She's got more than 25 years of management experience in industries including real estate, finance, and hospitality. She’s built companies from the ground up. She knows from experience that no government program alone can take the place of a great entrepreneur. She knows that what we can do is to give every business and every worker the best possible chance to succeed by making America a magnet for good jobs." Recently invited to shed light on "The Economy, Global Challenges and America's Future" at Harvard's prestigious JFK Jr. Forum and selected to speak on the evolving nature of work at the Fortune Brainstorm Tech Conference. Sought-out to join the board of Measure, a leading drone service company, and tapped to lead Chicago's effort to land the Amazon expansion bid. "It was a huge pleasure to host an event with Mr. Summers...[He] spoke in front of more than 200 guests on its insider view of international politics, the US economy, the management of monetary policy by the Fed, the Chinese slowdown, among others and all attendees were impressed with his presentation. Nothing but great feedback regarding his appearance." Recently sought-out for the National Investment Center's Fall Conference for a debate on "The Impact of the Trump Administration's Policies on Economic Growth" and a fireside chat at NYU Stern's Center for Global Economy and Business. Regular Financial Times and Washington Post op-eds provide frank and nuanced analysis on everything from the newly-passed tax plan to healthcare and global economic trends. Hailed as "hands down the most amazing and favorite of all of our speakers," at a recent Americans for Prosperity event, Forbes also just delivered keynotes at the CCIM Institute's Annual Global Conference, the Synergy Global Forum, and Prairie Crest Capital's Ag Tech Investor Conference. Just celebrated his magazine's 100th anniversary with the prestigious Forbes Global CEO Conference in Hong Kong. Forbes delivered a keynote and participated in numerous sessions to illuminate what the future holds for the global economy. "Thank you so much for all your help to secure the Secretary as our opening speaker and with your help through the planning process! It was a huge success! We received such great feedback on his remarks, interview and the panel! One of the best we’ve had. He is just the nicest man!" Made headlines for his shrewd remarks on the most pressing fiscal policy issues and underlying economic trends at Pershing INSITE, where he delivered both a keynote on the global economic outlook and participated in a panel on the Federal Reserve, capital markets and monetary policy for over 2,000 senior executives and office professionals. Recently selected to keynote the Caixin Summit, one of the most forward-looking events on the Chinese economy. Recently sought-out for an interview on the economic forecast by Bloomberg. "Working with Karen Mills was an absolute pleasure. Her speaking engagement was so well received and in turn we had many bankers request [a video of] her presentation. Karen definitely added to the success of our event and we were so glad she attended our dinner as well. I hope we have the opportunity to work together again." "Kevin was terrific. The board and senior executives truly appreciated the nuanced information he was able to provide from his first-hand experience at the Fed." As organizations look to what lies ahead for the economy and businesses, these HWA Speakers reveal the trends, shifts and policies that will have the biggest impact. Whether providing a macro understanding of the global economic landscape, or sharing transformative insights into how to grow your business and stay ahead of the competition, these HWA Speakers are trusted experts, heralded for presentations that are both informative and engaging.